You guys are in luck! Although I’m still loopy from this pretty harsh cold I managed to catch in the Jetwerx office in Calgary last week, I really feel like typing some long-winded stories this morning. No, that’s not the lucky part on your end. Fortunately for you, I was up all night coughing and now I don’t have enough time to blather on incessantly before the noon Eastern Time deadline. That’s how you got lucky. Of course, I was just going on about how I hadn’t been sick in over 2 years just before heading to Calgary. Boom, sick. And today is my birthday! We’re supposed to be going out for lunch with the 82-year-old couple from across the street and I really don’t think I should be passing any sickness on to them. They’re insisting though. Also, they want to go to the Mandarin for an all-you-can-eat belly-up trough fill. I’m not sure I’ll get my money’s worth, feeling like this. That’s my main worry, if I”m being honest! Anyway, we’ll push through and I’m sure I’ll get my fill. Maybe we’ll go in separate cars so I’m not filling their car with cough. So, on that lovely note, let’s get you through a cup of coffee, shall we? 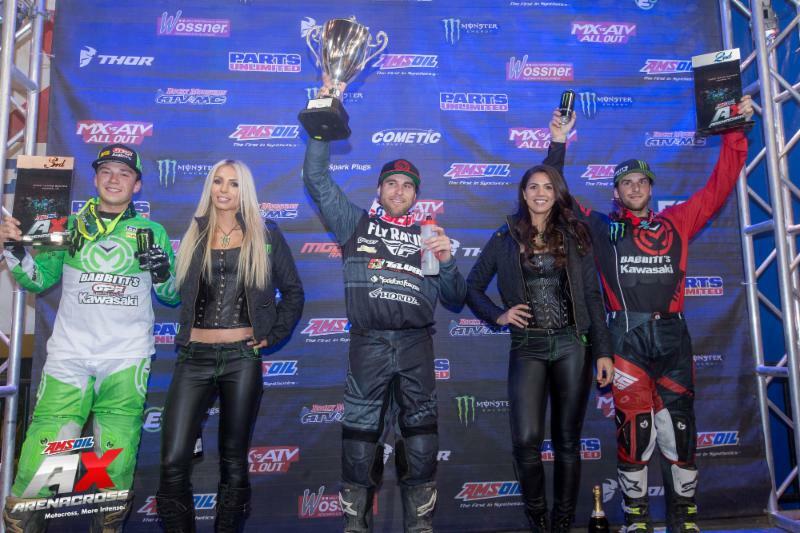 Who was pumped to see #15 Dean Wilson grab his first-ever 450 podium Saturday night in Indianapolis? Although the buzz and debate about his country of origin has died down, I think we, as Canadians, can still keep a warm place in our hearts for this guy. Also, if you watch the replay of the post-race press conference, Dean is the life of the party! Between him and Adam Cianciarulo, you don’t really need much more. They’re like Travis Pastrana or Travis Preston from a bunch of years back: great interviews. We’ll wait for Jeff McConkey‘s ‘McThoughts‘ column and Hammertime‘s ‘Reality Check‘ before we get too into the actual racing and what we thought. All I’ll say here is that I agree with what AC said at the press conference that I like it better when we all have to wait for Las Vegas for the East/West riders to face-off against each other. If they want to showcase this battle more than once, make it a 17-round series like the 450’s. Oh, how about the fact that nobody has won a 450 Supercross Main by a margin like Marvin Musquin‘s since Ricky Carmichael at the 2006 Daytona Supercross?! I thought it was interesting that he said it’s nights like that that are the easiest. You’d think going that much faster than everyone else, at that level, would be a little difficult, but when you’re on, you’re on! And that may have been the 450 podium that wins the “450 Podium All-Time Mr. Congeniality” Award. No? Dean Wilson, Marvin Musquin, and Justin Brayton are 3 of the nicest dudes in the paddock, for sure. Everyone seemed genuinely happy for the others on the podium…and I bet some of you reading this hated that! lol A little anger is always nice to see, but the fact that Justin said he “didn’t really want to pass” Deano because he was so happy for him to be up there for the first time, was pretty unique. NAMPA, Idaho., (March 25, 2018) – AMSOIL Arenacross hosted the first round of the Race to the Ricky Carmichael Cup inside the Ford Idaho Center in front of a nearly sold-out crowd. GPF Babbitt’s Online’s Ryan Breece extended his Arenacross Lites West points lead, and Chris Blose took over the 250AX points lead after a phenomenal victory over Jacob Hayes. The afternoon started with two-time defending 250AX champion Gavin Faith going down in the rhythm section, which forced a red flag as the points leader was transported off the track to be evaluated. In the first 250AX Main Event, TiLube Rockford Fosgate Honda’s Chris Blose grabbed the holeshot with Team Babbitt’s Monster Energy Kawasaki’s Jacob Hayes and Motosport Hillsboro Custom Power Sports Gared Steinke following in third. Blose and Hayes were battling it out until about halfway when Hayes made the pass stick on Blose for the lead. Hayes took the first Main Event win with Blose second and Heath Harrison third. The second Main Event saw Hayes take the holeshot with Blose close behind and Sportland 2 TZR Racing’s Travis Sewell in third. About halfway through the second Main Event, Blose made the move on Hayes for the lead and was on a mission for the overall. Hayes and Blose went into the last Main Event tied for the overall, because Blose took the extra point in the Rocky Mountain ATV MC Head to Head victory. Blose finished ahead of Hayes, and Ryan Breece rounded out the podium. Chris Blose secures the 250AX points lead with his second consecutive AMSOIL Arenacross overall victory in Nampa, Idaho on March 24. In the second round of the AX Lites West season, GPF Babbitt’s Online rider Ryan Breece took the holeshot and never looked back, leading all 15 laps. His teammate, Isaac Teasdale, quickly moved into second and followed close behind while Yankton Motorsports’ Preston Taylor raced his way to his first podium of the 2018 season. The 2018 AMSOIL Arenacross season resumes with Round 9 on April 7 in Wichita, Kansas. Canadian racer, Christopher Fortier, turned Pro last season and headed north to race the Canadian series. He was in a tight battle for ‘Rookie of the Year’ early on and then had a crash during practice at a track near Gopher Dunes. When he got to Quebec, he got checked out and they determined he had a severe concussion and that racing with it made it a lot worse. Unfortunately, he was out for the remainder of the season. He’s raring to go and give it another shot in 2018, but he’s looking for some help to make this happen. If he receives some assistance, he will make a run at the full season. If he doesn’t, he will pick up the series when it heads east. Good luck, Christopher, and hopefully we see you on the line when the series fires up at Wild Rose MX in downtown Calgary at the end of May. If you’re looking for a great bike at a great price, I’ve got another one for you. This is an XL Scott Addict DISC with Ultegra. If you’re interested, please send me an email at billy@directmotocross.com.